Wow. Cool. I feel very enlightened and informed now. I would have liked hearing more from Sushi. Seemed that she was nudged out of most of the question/answer time. Where does she poo? (which leads me to the same question about you and LeeAnn.....oh...never mind :) Does she love living on the water or does she dodge for land whenever the opportunity arises? What does Sushi like to eat? I am also curious.....Dramamine knocks me out. Doesn't it make you tired? Is that why LeeAnn doesn't get "that sick of you" because you are knocked out half the time? Well, that is enough questions for today :) I am sure...given enough time...I can come up with some more if you would like!! Seriously, glad you are all doing well. Tell LeeAnn she should start a blog on being a Hobo Sailor from a womans perspective. You are very entertaining Chad and as your aunt I of course love you to no end....but would enjoy hearing from the lady of the boat. I have a question for you - my boyfriend and I are thinking about setting out on a similar voyage with our dog Sophie. Do you ever have any problems trying to get a pet into other countries without a quarantine? Thanks from landlocked Edmonton, Alberta, Canada! Dogs are a lot more common on boats than cats. It's easy to check your animal into the bahamas. Just get the paperwork completed before you leave. I don't know much about other islands in the carribbean, but we do know people who are currently traveling the islands with dogs, so it must not be too bad. Do keep in mind with your dog that you will need to bring it to shore (probably twice a day, rain or shine) for it to use the bathroom. Sometimes just finding a place to walk the dog can be a challenge. I would reccommend a large dinghy that can accomadate the dog. Human food can be hard to find in the bahamas, I would buy all the dog food you need from the states before you leave. Changing the dog food constantly might make it hard on your dog --- he will be "holding it" a lot more than he is probably used to. Pretty cool blog dude. Kudos! Ok.. I understand that if you budget well you can make your money go a long way. But the money still has to come from somewhere,right? How do you make money so that you can keep sailing? We stop along the way to work and make money. We also take that time to fix and make improvements to the boat. I came across your blog and found it to be very helpful and entertaining. 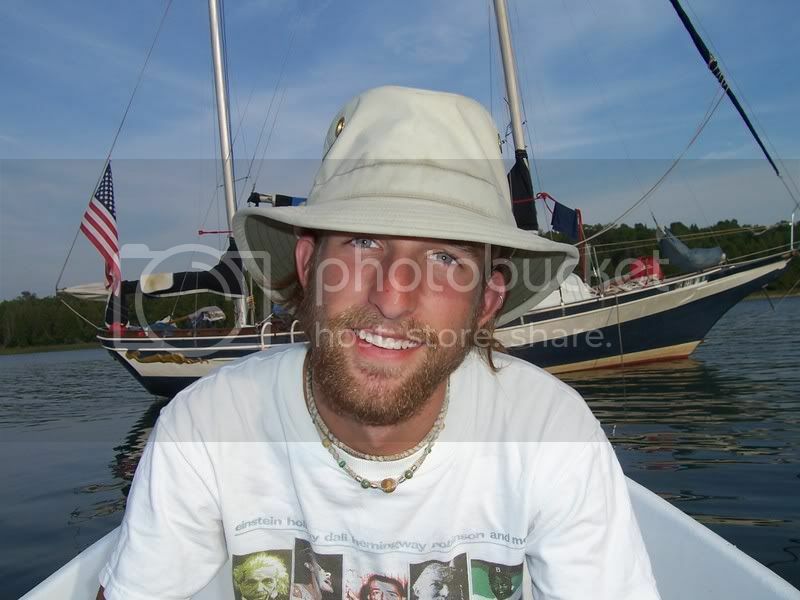 My boyfriend, George, and I are planning on starting our sailing adventures New Years Day 2010. George just recently put a down payment for a 1989 J33 JBoat. It was a deal of a lifetime that he couldn't refuse and it really kicked us into motion to get out of the states and living on a boat. Our boat is located off of the island of Tonga in the South Pacific. George has a close contact with someone that has spent a lot of time traveling that area of the world, and has been a great source of information and encouragement. He was the one that set us up with the great deal on the boat. As of right now, we are forming a business plan for a source of money, as well as something fun for us to do together. I know and am expecting to undergo many lifestyle changes, and that is one of the most exciting things about it, but I'm also trying to learn as much as I can before our departure. I don't necessarily have any particular questions, but wanted to let you know that that your blog is a very helpful Q&A session. They are simple, yet necessary questions. It has inspired me to go through with my dream to sail the ocean blue. "What would be the best boat for your buck?" "What books would be most instructuve?" i would prefer to learn from others mistakes than suffer through them on my own, so any help would be great. Wow this is so cool! What a fantastic way to live your life, I am officially jealous. Even more jealous that you have found someone with whom to share such a specific lifestyle. I'll definitely be reading, I love this! It seems to me that you both are living a good life and are doing what very few people achieve: what you want. Two people like you can only be sending out positive energy, and as one human to another, I'd like to thank you both for that. I have always had the adventure bug. It never wore off from childhood. I have been "anchored" in medical school for 4 years now and am almost done, and must finish this adventure before I start another. Unfortunately, there are no "traveling" medical schools. If such a thing had existed, however, I would have been the first one to sign up. I'm sure that I don't have to tell you both to keep it moving and living life at life's natural pace. To keep the dream alive. I think the worst sin we can commit is conventionality. It's plain, boring and unoriginal. It's suit and tie, starbucks and hamburgers. It's do what you do because there is no other way. It's give up your childish pursuits and pursue the life of conformity. Well, just the fact that you said no to that, makes me know that we could get along. So, friends, I wish you life, water and fish. One could ask for little more. My BOyfriend and I are 37 and 34 respectively. his goal is to live on a boat in 7 years. Thank you for your blog. I have to admit I am nervous but excited. If you're not scared you're not growing! The video gave me goosebumps... fantastic! is the gas only for cooking? 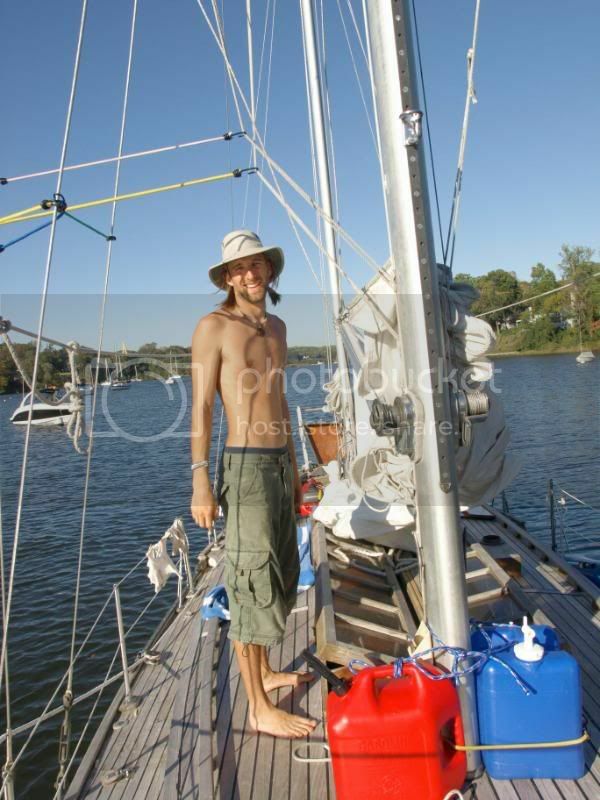 when u life on a sailboat then why do u need gas? Sorry if its a stupid question but its just because gas also costs a lot of money.. ? a little bit of gas goes a long way on a sail boat. I love this blog! It's so cool! I live in Fort Lauderdale, do you ever come down to South Florida? We have a huge sailing community down here, if your ever in town dinner is on me! Maybe you can convince my wife to let me buy a sail boat. LOL, maybe I should learn how to sail first. Amazing blog! As if I weren't restless enough already... One big question, though - How on earth do you both stay (incredibly) fit living on twenty-some-odd feet of boat?? My hat's off to you. Really interesting. I might try this someday although I don't see myself spending more than a year with this lifestyle. But then, who knows? Nice webpage amd hope to see more videos. Im going to sailing around myself looks later this year. Im selling off my properties so I don't have to worry about them while Im gone crusing. Im going to be doing lots of underwater filming diving and using a underwater ROV system to creat some cool videos I might sell on the net as I cruise. I will also be doing some fine art prints from my photos and also some vinyl cutting on a small cuttter for people that might need some vinyl graphics. The units are small and don't take much electric. Im looking at some catamrans like the Gemini 105 new model. You guys keep having fun and exploring the world and creat some stuff on the way. for free as you travel. You are one lucky guy to have a girl that like to do these things with you. Hope it continues for the both of you and keep being fun, thats the main thing. Love the fact that you knew nothing about sailing. As with anything, it's when people think about the risks that they don't do something. Sometimes you need to just say "What the hell!". More of us should take that "risk". We would all be much happier... and the world would be a better place. I love the arcade fire, music was perfect for the video. I have always wanted to explore boat living but job/life seems inescapable. I recently decided that sailing is something I should try before I quit my job. I live in the great lakes state so I should be good on that. Thanks for posting this site. It's lets me know I am not crazy to think this is possible! We don't "have money" we work, budget, save, work some more then go sailing! The post above covers how much it costs, and how we can afford to do it. Thank you for this blog! This post was helpful to me as I am planning to buy a cheap boat and live on it with my girlfriend. I love to see people overcome money issues!!! You don't need to be rich to do cool things, only creative! Also, for the seasickness, you may want to ditch the dramamine and try ginger, its 5X more effective i've heard. Good luck to you in the future, happy sailing! Thank you Chad and LeeAnn! This post was very helpful to me, as I am planning to buy a cheap boat and live/sail with my girlfriend, im 26, so hopefully by the time im 30, more hopefully in the next two years. We currently live on maui im very surprised at how cheap some of these boats are that come around. I love to see people overcome money issues!!! A little creativity and you don't need to be rich to do cool things. For seasickness, try ginger, i've heard it's much more effective than dramamine. Reed's ginger ale is usually cheap and has a bunch of fresh ginger. Good luck to you guys, happy sailing maybe I'll see ya around haha!! My husband & I live aboard a 34' sailboat July-Oct for the last 4 years. We live in a house-on-dirt on the East coast in the winter, and seek cooler coastal weather in the summer in southern California. While it is true, we don't really rough it since we are in a slip at a beautiful yacht club, I am amazed about the questions people ask me about living on board. We get this one frequently: "Do you take your boat from Florida to California, and back again?". Really now, that would not be very practical! Besides we don't mind keeping Southwest airlines in business. But the best one is this: "How can you two live together in such a small space?" Well, I say if you are married to someone and you CAN'T live together in a small space, then there is a problem. We make a great team and my husband is 74 years young. Constant boat maintenance, cleaning, leaning, reaching, sailing, even boarding the boat & negotiating the stairs & steps keeps us healthy, limber, flexible. Lastly, why would anyone live in a house when they could live on a boat? You guys are awesome and will have significantly less regrets when you are old and gray. Do you guys ever get scared in rough seas? As stated above regarding rough seas: When Sandy came tearing up the coast what did you guys do? Hell yes we get scared in rough seas! My favorite thing about sailing is anchoring in a well protected harbor! Best advice for hurricanes is to take a river inland. Great life story and love the humor. Takes guts to live like that & don't think I have enough, sigh. 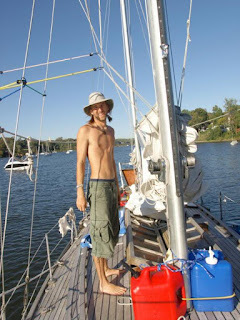 - How does Chad live on a sailboat if constantly dealing with sea sickness? PS With a girl like LeeAnn, however you convinced her to live on small tiny boat with you was genius. We never locked the boat, and never had any trouble except one time when my bike was stolen off the boat in Charleston, SC while we were docked. We never had a problem while anchored out. As far as sea sickness goes, I just take medicine. Only really feel sick in the mornings on an empty stomach, or in very large following seas. LeeAnn is really awesome. That's why I married her!! 1) What do you do with dingy when you go ashore? 3) Can you anchor near nicer port areas next to all the mooring balled boats without being charged a fee ? Thanks and as you can see all landlubber type questions at this stage. 1) In many places you can just tie it up and leave it. However in some places it should be locked, and for that we bought a 15' stainless steel cable from a hardware store, clamped the ends into loops. This was probably unnecessary, our dingy was a piece of junk, and the motor was trash too. 3) Many of the "nicer" port areas don't have mooring fields, just anchorages and docks. There was only one mooring field we've come across with strict "no anchoring by the mooring balls" rule. It was at Shroud Cay in the bahamas. The island was uninhabited, I don't know what they cared. Probably because they paid to put in all the mooring balls, and there they sat. Empty. Other than that, we have never had a problem anchoring. We have even anchored in marina's, though, we were young and innocent, I don't know if the harbor master would let us pull a stunt like that now. Skipper Bob's "Anchorages Along the Intracoastal Waterway" is a very handy book to have for anchoring along the east cost. What a great blog. Here are a couple more questions if you have time. 1) when sailing over night, do one of you have to stand watch? 2) how often are you boarded by the coast guard? 3) how many places do you visit in a month, and where are your favorite stops? 4) how do you stay in contact with family and how often do you "check in"? 1) Yes, someone is always on watch. 2) Surprisingly, we have never been boarded by the coast guard. Kinda puts "homelade security" into perspective. I have a friend who was boarded on a crossing midway from the Bahamas to Charleston, SC. I looked but can't find the post. It was an interesting read. We would have been boarded by the drug cops in Blackpoint settlement, Exumas, but we were not on the boat at the time they were making their rounds. 3) Really just depends. Some places are more interesting than others. Some times you just get tired and want to stop for a month, other times you only stop for a night. 4) We keep in touch with email and this blog. We also have a handy little tracker device called a "spot" that sends a signal to a satellite and plots our position on a map as often as we care to update it. In regards to the other comment about health insurance, it's probably a good idea to have some major medical. What type and size of boat is it that you 2 live on ? I am 18 and am saving up for a used catalina 22 to live on for a few years. The boat you are probably asking about was a Privateer 35. We own a Lagoon 380 now. Catalina's are awesome live aboard boats! My husband and I are getting a 36 Catalina ready to live on in the Baltimore harbor. Big life style change for us. We get along very well but this will be really close quarters. Any advice on how not to get on each others nerves while so close? We both worth full time so we will have at least 8-10 hours a day apart. Hello my name is Blake and I have a question. Being so young what do you do for a living to be able to live on a sailboat. Living on a sailboat is really pretty cost effective. We bought the boat for 9,500 which was paid for with savings and from the proceeds of selling our previous boat. While in Charleston, SC we rented a slip for $300/month which included all utilities and access to laundry facilities. We had an incredible deal. Others in the same marina were paying 400 - 500. If you can afford to live on land, you can afford to live on the water. Trying to do both is what gets expensive. You can buy a sailboat for much less than what you can buy a house for, and living on a sailboat can be very cost effective. Does anyone know the make of this sailboat? Hi, thanks for your "story" I enjoyed it and the insight you gave. I have a cat as does my girlfriend, so that will be interesting indeed. I'm looking at buying a 39'+ to live and travel on. I'm semi-retired and can "work" from anywhere I can get internet connection. Once again, great post! I couldn't find where you mentioned the kind of boat you had. I'm thinking of buying an Alberg 30 to live and cruise on. Are you still sailing now? If so, when do you think of stopping and joining the landlubber life? Thanks again for the posts. i recently had a love spell cast on my partner last week after we both had a misunderstanding that almost lead to divorce and i was about losing my husband so a friend of my Natasha advice me to quickly order for reunite love spell that will make my husband change his mind from divorce which i did contact ekakaspelltemple@yahoo.com after the casting of the spell i receive a call from husband apologizing to me on what happened i can't thank you enough Dr ekaka you are indeed a god gifted spell caster. So I just stumbled across your blog while googling this sort of thing wanting to know if it's possible to DO what you're doing without being super rich before hand (and without already having an abundance of sailing expertise), and this is EXACTLY what my fiance and I want to do! It's like the perfect lifestyle, as hard as some times would be. Personally I'm scared of the storms at night time. But, hey, looks like it's worth it. I'm really glad you wrote this blog, you've given me a lot of inspiration! Awesome blog! Hi where are you guys now? What a dreary existence - living on pennies. Must get tiresome. Sure, you can live on a boat and cheaply. But seriously, grubbing a living for the rest of your days doing the same old same old? Sounds awful. Good luck - you're gonna need it. Especially as you get older. Hey there. How guys do look happy. I am happy for you too. BTW, you guys look really thin. I hope you are just really fit and not starving to death. Ha! Glad I saw your video. hahah yeah we eat a lot of food. Could you talk a little bit about any kind of social networking that there might be for people living on sailboats? I imagine there is a distinct divide between sailboat hobbbyists and sailboat residents, is there a club or social network or magazine for you to all kind of come together and socialize? Great point! you are totally right! Facebook groups are great for that. I'm a member of "Sailing and cruising with kids" and Liveaboard sailing families". You are also correct about the divide, there is an invisible "club" that you earn membership to after sailing south on a sailboat. You meet others sailings, learn of opportunities, etc. I imagine this is really the same as any activity where there are hobbyists and people who do it for a living. Do you have a cat with you on the boat? How design that work? I watched your video and really enjoyed it, you two have something to look back on the rest of your lives... it looks like fun ! Enjoy life to its fullest ! !